The Black Lily is a parser-based mystery of sorts. I played it through using the walkthrough, and then I managed to find several additional endings. This story concerns a man who is obsessively attracted to women who have some association with a black lily. In a series of scenes we flash back to his encounters with them, which always fade to black; the strong implication is that in these interludes he is committing a murder. She shot me a look which hit me with the force of a sledgehammer, but with the tip of a dagger. Unquestionably the author has in mind a very specific mood and style; several other reviewers have referred to this as giallo: I’m not familiar with the genre, but even without that touchstone, I found myself envisioning the passages of the game as cinematic, high-contrast black-and-white scenes. The interaction is more difficult; or rather, it took me a little while to understand that various standard IF actions were not worth pursuing (for instance, talking to characters is rarely important except at the very end) and that in order to progress, I should focus on preserving and pursuing whatever mood my protagonist was in at the moment. In a reversal of the way these things usually work, I started out looking frequently at the walkthrough but moved away from it in some of the later scenes as I gained confidence about the type of interaction the game was seeking. I am not sure that it was a good choice to make the walkthrough solution be the one that provides the least information; I think it’s possible that some people will get stuck, go to the walkthrough, find it bewildering, and then not know what else they should try in order to get a better or deeper experience out of the game. 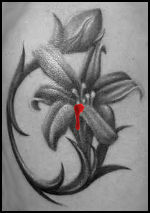 Repeatedly we see the protagonist drawn to women who are associated in his mind with the sigil of the black lily. It’s not immediately obvious whether the lily is a supernatural sign or whether it is a projection of his own madness, a marker that exists only within his own mind. In the end, however, he encounters the little girl named Lily, and this becomes a trigger for the game’s ending and the resolution of the protagonist’s state: he may decide to kill her, to flee, to confess the truth to Dagmar, or (in the last ending I found) to embrace Lily. If he is caught, he is locked up surrounded by women, which he resents badly. We also see a brief passage of dreams in which he remembers his mother, sitting at her table in the same posture as his victim Nieve, apparently oblivious to his existence. So perhaps what we are supposed to understand is that “Lily” represents some feminine principle which the protagonist both fears and desires, and has been driven to destroy when he has seen it at its purest; but when he encounters it in juvenile form, no longer sexualized, he doesn’t know what to do, and can either reconcile with it (the “hug” ending) or oppose it openly despite its obvious innocence. If so, that plays into a number of existing tropes about misogynistic serial killers who had a bad relationship with their mothers, but it is done in such a highly stylized way as to stand a bit apart all the same. Several other pieces in this comp also delve into mindstates altered by drugs, religious ecstasy, mental illness and shock. Perhaps the single-minded focus and eroticism of the protagonist’s worldview should be read as the same sort of description. I am at any rate grateful that the game does not require the player to explicitly carry out the murders. I’d also be curious about how to get more than 3 points. I found the clippings in the safe, by picking up the key from my hall shelf first, but I gather there are another 7 points I could get in some fashion. I did find several endings, though. The protagonist of this game has not one but two important secrets – the first one (being a serial killer) is associated with the safe key, the second one – with the key to the bathroom cabinet. And I think opening the cabinet deserves to be nominated for Best Individual Puzzle. I managed to score 8 points out of 10 and found all the endings. Should I post spoilers here? Please feel free. I’m curious. OK. “Lily” is/was the protagonist’s name. The little girl is the protagonist’s younger self. I’ve got a great “AHA!” moment when, after everything fit together – cover art, descriptions, reactions to “touch myself”, “use urinal” (in the club), “x cabinet” (“I store hygiene articles which are not needed all the time here”), trying to undress, to swim, – I knew what I was going to find in the cabinet – and knew how to open it – and it worked. The endings: 1) “out”; 2) “show clippings to dagmar”; 3) “hug lily”; 4) “kill me”; 5) “kill lily”; 6) “kill dagmar”; 7) “break mirror”. Ah! Interesting, okay. I did not get that at all. Thanks! Also spoilery: I got 7 out of 10 points by game’s end; I didn’t visit the club’s restrooms at all. I did unlock the cabinet, though, and was annoyed that the only response to doing anything with its contents — some pads — was “I’m weary.” I didn’t think to examine the cabinet itself and I didn’t know what I was looking at inside the cabinet; “some pads” could’ve meant scrubbing pads to clean the bathroom with for all I knew. The coy business with mirrors made me think that maybe the PC was a vampire, but since I couldn’t examine anyone’s neck, I thought, okay, it’s something else. I spent some more time this afternoon in the bathroom but still failed to get the cabinet open; but I’m not surprised to hear what was in it, after various other things. There’s another point I found if you find a cave by the beach and go swim alone. Can’t find the last point though, but I assume it’s somewhere in the town square scene. Measure your feet in the shoe store. You should take the key to the cabinet from the office with you in the last flashback – but you shouldn’t look at the shelf in the hall beforehand. It won’t cause a time paradox paralysis :) – but it’ll be assumed that you left the key elsewhere (in the shop, as far as I remember). The author calls the game “a story in a pulp tradition”. It isn’t deep – but it’s surely interesting.